Strong ultraviolet is more easier to hurt the baby's skin, and the baby's eyes also have a certain hurt. Good sun hat is really particularly important to the baby. This children' sun hat with a wide brim give the children the best protection in the burining sun. The design can effectively protect baby's face, ears and neck behind. Hurry for your children to buy it. We Are Committed To 100% Satisfaction of our customers. ● 1 * Neck protecting sunscreen hat in opp bag. ● For age: 2-12 years old. ● Material: nylon + spandex. ● Colors: Navy Blue, Orange, Lake Blue, Pink. ● Machine washable and dryable. ● Suitable for Spring, Summer, autumn and winter. ● Ties under chin, elastic string with toggle for adjusting size of crown. 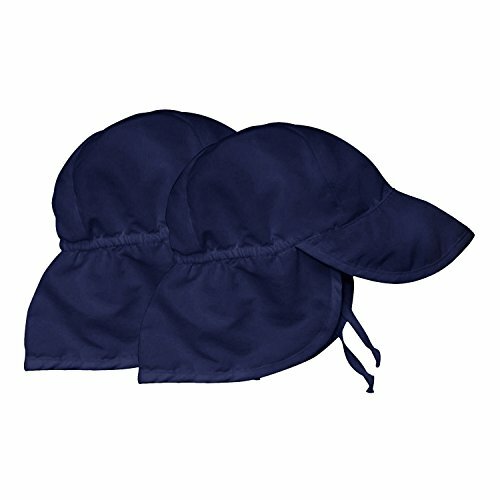 ● Attached drape protects neck, flap hats are baseball hats with a longer neck flap for great sun protection. ● Wide brim offers extra protection: Sun hats can protect baby's face from the sun's harmful rays. ● Flap hats protect kid's head, face, neck and back. Durable, comfortable, and provides great protection from the sun. The quality of all products can be guaranteed. If you found any quality problem, please contact us in the first time. We provide you with the best customer service. UPF50+ FABRIC: Children Sun Hat UPF 50+. Very breathable and silky Nylon & Spandex material. It's lightweight, soft and easy to clean and maintain. ADJUSTABLE ELASTICITY: There is a adjustable tightener in the back for you to adjust size of the hat to fit your baby comfortably and also can prevent it from being blown off. WIDE BRIM: This hat has a wide brim that helps to shield baby's eyes, face, neck and even shoulder from the sun well. Excellent coverage hat protect your baby from irradiating the sun's rays. CONVENIENCE: Perfect combination of practicality, safety, comfort and style. It is so lightweight, adjustable and soft so you can fold it up and toss it in your bag when you travel, storage or go to the beach. THE CROWD AND AGE: Available for babies, infants, toddlers and boys. For age: 2-12 years old, a very useful hat in daily life for your children. If you have any questions about this product by Sunlightfree, contact us by completing and submitting the form below. If you are looking for a specif part number, please include it with your message.